Eternal Orthodox Church calendar for the 21.04 year 2019. They were all among the Seventy, and are all mentioned by St Paul in his Epistles. Herodion was a kinsman of Paul's: 'Salute Herodion my kinsman', he writes to the Romans (16:11). Herodion suffered greatly at the hands of the Jews as Bishop of Neoparthia; he was beaten about the head, stoned on the mouth and stabbed in the legs. When they had left him for dead, St Herodion arose and continued to serve the apostles. He helped the Apostle Peter in Rome, and was beheaded along with many other Christians on the same day that Peter was crucified. St Agabus had a spirit of prophecy. Two of his prophecies are recorded in the Acts of the Apostles. First, he prophesied a great famine throughout the world, which came to pass in the time of Claudius Caesar (Acts 11:28). The second was when he met the Apostle Paul in Caesarea. Paul was on his way to Jerusalem, and Agabus took Paul's girdle and bound himself hand and foot, saying: 'Thus saith the Holy Spirit: so shall the Jews at Jerusalem bind the man that owneth this girdle' (21:11). 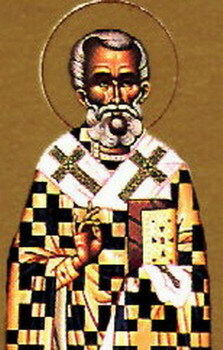 St Rufus was Bishop of Thebes in Greece. The Apostle Paul mentions him also: 'Salute Rufus, chosen in the Lord' (Rom. 16:13). St Asyncritus (Rom. 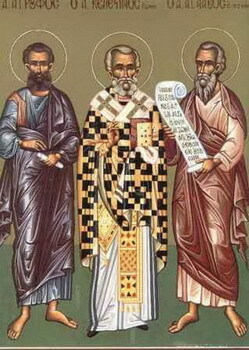 16:14) was Bishop of Hyrcania in Asia, St Phlegon, who is mentioned in the same place as St Rufus, was bishop in the Thracian city of Marathon. St Hermas, mentioned with the others, was bishop in Dalmatia. All these, with bee-like industry, spread the Gospel, suffering greatly for the love of Christ. They all went to the eternal Kingdom of their beloved Christ. He was adorned with zeal in the building and repairing of churches and with great courage in opposing tyrannical princes. 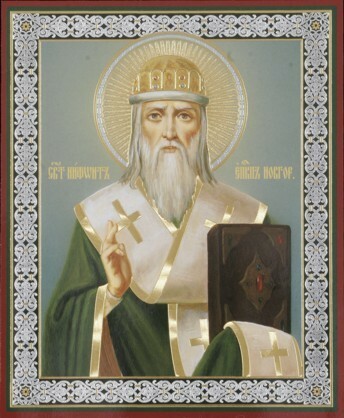 Thirteen days before his death, St Theodosius appeared to him and predicted his imminent departure to the other world. He entered into rest in 1156. A great zealot for the Orthodox faith, he wrote an epistle against the Nestorian heresy at the time of the Third Ecumenical Council. He entered peacefully into rest in 432. 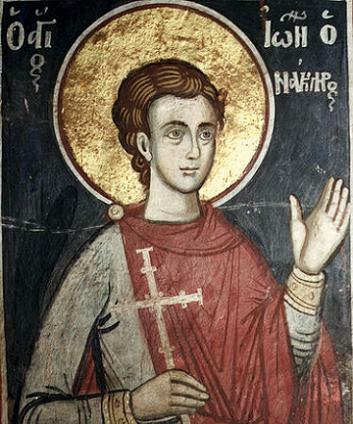 The Holy Martyr John the Shipmaster (Naukleros) suffered a psychological sickness. One time, when he was found in an unconscious state, the Turks made over him the rite of conversion to their religion. Coming to his senses, the saint angrily threw from his head the symbol of Islam – the turban. He bitterly bewailed the indignity that had occurred and continued to live as a Christian. The Turks then threw the martyr into prison. Neither lecturings, nor beatings, nor threats could bend the will of the saint, and he repeatedly replied: "I believe in the Lord Jesus Christ and I refuse your faith". After many torments they burnt the martyr in the city of Koe on 8 April 1669.